The Supreme Court of the Gambia in a unanimous decision has on the 15th March 2019 dismissed the application of Ya Kumba Jaiteh to restrain the National Assembly from swearing-in Foday Gassama as a nominated member of the House. Ya Kumba Jaiteh is an ex-nominated member of the National Assembly (NA) brought an action before the Supreme Court to declare the revocation of her nomination as a member of the NA by President Adama Barrow as unconstitutional. The NA is set to swear-in Foday Gassama as a nominated member on Monday the 18th March 2019. Ya Kumba made an application for the Supreme Court to restrain the NA from carrying on the swearing-in of Mr. Gassama. 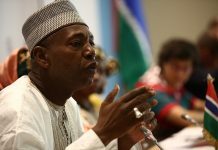 In delivering the ruling, the Chief Justice of the Gambia, Hassan B. Jallow said the Plaintiff (Ya Kumba) challenged the revocation by the President of the Republic of her nomination to the NA as invalid and sought a declaration to restrain the NA from swearing-in Foday Gassama as a nominated member of the NA. III. An order restraining Foday Gassama from “parading” himself in any way as a member of the NA. Justice Jallow indicated that the Clerk and the Speaker of the NA opposed to the application that it should be disallowed. “Having considered the submissions of the parties and on the basis of the legal principle favouring the presumption of the regularity of all official acts, the applicable principles of law relating to the grant of interim restraining orders the court has come to the conclusion that the interim orders applied for by the plaintiff (Ya Kumba) should not be granted. The application is accordingly dismissed in its entirety,” the Chief Justice ruled. He indicated that the court further considers it necessary to the circumstances of this case, to emphasise that all arrangements for the assumption of office by Foday Gassama as a nominated member of the NA should proceed. “The Plaintiff (Ya Kumba) is hereby ordered, pending the determination of the suit, not to interfere with that process of swearing-in or with the execution of the third respondent of his duties (Foday Gassama),” the court ordered. He stated that the reasons for the dismissal of the application will be incorporated in the final judgment of the court in this case. The case would proceed on the legality of the sack by President Adama Barrow of Ya Kumba Jaiteh as a nominated NA member. The case will be coming on the 26th March 2019 for hearing. The court gave the lawyers for Ya Kumba 7 days to file their statement of case and 21 days to Lawyer Binga D. who represented the Attorney General to reply.